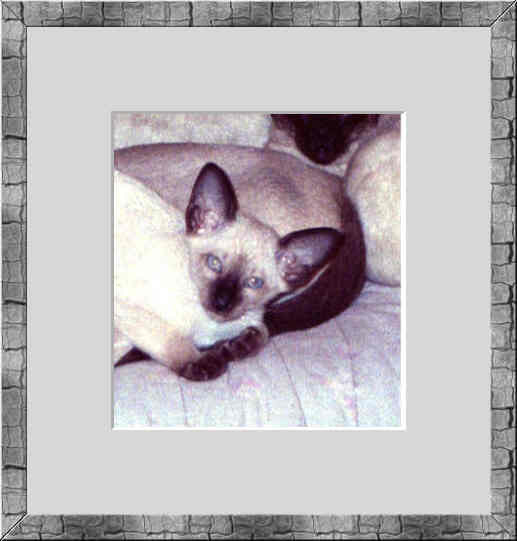 Shocho's Siamese & Orientals Girls' Page! Welcome To Our Girls' Page! It is my policy to spay my queens that require C-sections to delivery their kittens as I do not feel this is fair to them. Most queens experience difficulty in accepting their kittens once they have been sectioned. My queens are bred only once a year to maintain their health, and then usually retire between the ages of 5 and 7 years, leaving them with many happy healthy years to cherish as someone's special indoor pet. To see which cats are available, please visit my Retirees Page. We have two new blue eyed white Oriental girls called Moonbeam and Crystal.